So, that’s a lot of dirt, right? Not as much as you’d think. Imagine transferring something from one container to another, like a spice. As you fill the new container, you periodically stop and tap it on the counter to make the contents settle so more will fit. Filling the raised beds is a lot like that. Apparently, the dirt the big truck dumped in our yard (manly man has yet to recover from the tire tracks it left) was inflated or something. When we move a wheel-barrow full to a bed, dump it, and spread it out, it sort of diminishes in depth, as if the air had been let out. 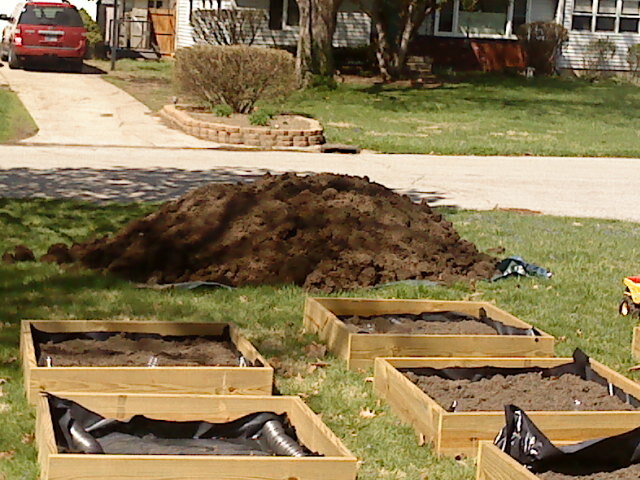 Where you thought you’d filled the bed, you’d only added an inch or two of soil. I still think we won’t use it all (the manliest man and one of my sisters have expressed interested in leftovers), but that remains to be seen. P.S. Also on tomorrow’s agenda: I attend a class on vermicomposting so I can learn to properly care for our box of worms. Oh, there’s so much to tell!